Dressing for my fantasy life	Fashionably late to the YLF ball? Hahaha. Half my closet is “personal vintage” (I’ve got to remember & use that phrase), but I can only think of one item half as cool as those pants. My favorite looks are the last two, not just because you work in your coat, but because my response would be a “safe” basic black, so I love that you have tonal matching in one and some very cool stripes in the other. I would wear them on New Year's Eve!! I especially love 1/2 and 6/7 -- the straight/ A line seems to boss the volume in the bottom around just enough. Wow. No wonder you saved them. I don't have much "vintage to me" left in my closet, alas. For decades I had an 80s Vuokko dress and two same-era Marimekko dresses from the years that I worked for a firm that sold them. But moths got to the Vuokko (which I loved, loved, loved!!) and the others had never really fit and alterations made them worse, so with great regret I let them go. The vintage items I have now mostly belonged to my mother -- some gloves, clutches, jewellery -- easier stuff to incorporate. OMG, I think they are awesome, and don't hearken to any particular era as far as I can see. 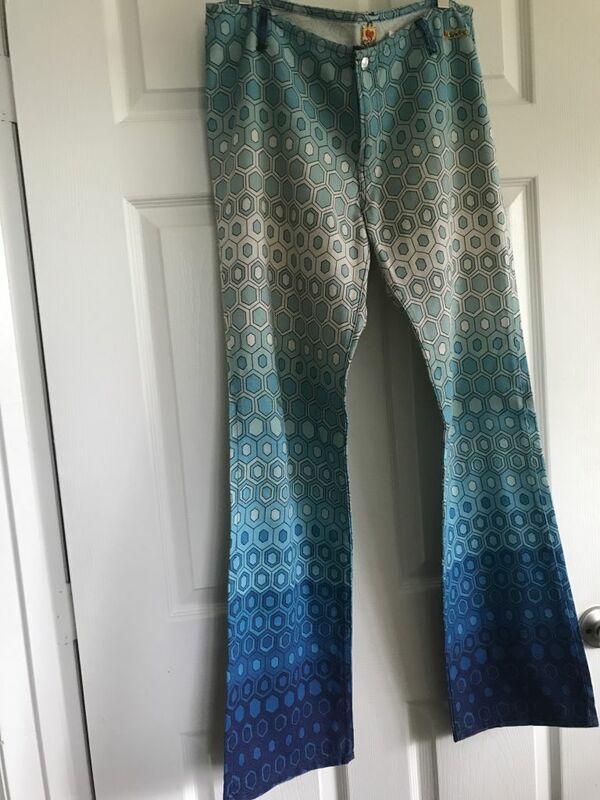 I think they're just funky-unique and don't really see any kind of era association with them, but maybe because I've never seen pants like that anywhere! Please keep and wear. I think they look amazing on you. Hehe, they remind me of this sweatshirt I got a couple of years ago -- I just wore it the other day. It's fun with a colored long sleeve tee underneath to show a different color under the grommet holes. Those do bring me back to the 90s! But hey, they fit, and they're fab, and you're styling them in a more modern way. I think you're right that Rihanna would approve. Liz, honey-pie, no more overthinking. THE TROUSERS ARE KILLER FABULOUS. You are ready to wear them - again. Oh, you look fab in those pants! They are so unique that they do not look dated in my opinion. I especially like them in pic nr. 7. I have kept many beloved clothes from the Eighties and I would wear them again in a heartbeat ... if only I was still the size I was back then. Agreed with all above. Those pants are so cool and unique that they transcend eras. "Dated" just doesn't apply. #2 and 6 are my favorite iterations, but they all look amazing... I absolutely love your style and it suits you perfectly. My thoughts are similar to Janet's--the grommets are a current trend, and in today's anything-goes aesthetic, a vintage iteration of a current trend (including with items we ourselves bought brand new decades ago) can totally work. And like Sisi (and Srah, and...) says, when something is that different, it can transcend datedness! I don't remember seeing anything like those in the 90s, but I lived in Boston then and trends were a little less global. Well, I did have some jeans cut like that in the early 2000s, but that's not quite the same thing. I do have "personal vintage" bought new back in the day and also items I thrifted as far back as the 90s (a few of which themselves are from the 60s and 70s), and yes, I wear when relevant. Every fashion season, I check my closet against current trends and see what I already have that suits them. Nothing dated looking about these fabulous pants. You can make new reference points by wearing them. As far as my closet, my most vintage things still around are from after a weight loss about 10 years ago and are handed down from my mother or sister's DMIL...scarves, jewellery, a kimono. Women wore no jeans or trousers when I was young, and my old mini skirts would look too odd on 71 year old legs! My favourite is the 1-2 picture. The pants really stand out here. The style is perfect on you! As for the personal vintage - it is an interesting questions. It made me realized that I haven’t got as many personal vintage clothes as I thought I had. The oldest clothes which I bought new (non-vintage) and which I still wear are about 10 -12 years old (not vintage yet, just old, right?) It is due to the fact that my body has changed during the years and I donated some beloved pieces, which I otherwise would have loved to keep. On the other hand, I have kept my handbags, loads of scarves and sunglasses and my costume jewelry. In those areas, I have a lot of personal vintage items. I do not wear them all, some are still waiting for their revival, but I enjoy having them anyway. "But I like them dammit! Yes, I like these pants and I’m willing to give them another go. " I think you answered your own question here. We need to dress ultimately in what we like, regardless of what anyone on this site says. Those pants are so "YOU". Enjoy wearing them. Yes, I have some clothes from long ago, that I simply love, regardless if they're outdated, the wrong shape jacket, or whatever, ie., a couple Escada jackets, long length, but super quality with gorgeous gold buttons. Yes, I look like, I am the little old lady from Pasadena, but I love them, recall buying them, and will wear them with pride. Thanks everyone! I obviously just need to take my '90's goggles off. Angie's right. I'm overthinking again. fashiontern: you need to keep hold of those pants! Layer them with a long-line tunic and you're done. Suz: ah, those ones that got away! I know we talk about this from time to time. This all helps me figure out what should stay and what should go. bonnie: 4 might be my favourite. Maybe not the most flattering, but it feels quite unique and true to me. I like the proportions. Janet, I should have credited you with the inspiration! Your grommet top was definitely a prompt to dig these out. Christina F: maybe it depends on where we were at the time? Perhaps this look was very niche. Angie: *blush* I think my bum is the only bit of me that's ageing gracefully right now! Sisi, Srah, thank you, that's very kind. Joy, honestly? You could still rock a mini with boots and tights. But I know what you mean, there comes a time some things just don't feel right any more. Katerina, that's a good point. I used to think 10 years was around about the cut-off point, but does that mean if you keep something for more than 10 years it's with you for life? Something to ponder. Violett: hah yes! And I hadn't even tried the Escada jacket yet! It's one of my absolute favourites. You're aging gracefully FULL STOP. Rock on. They don't look dated. They look unique and artsy and YOU. My favourites are #2 and #6--great styling! Approprio, one day. I’ve lost weight each of the last two winters. I’m hoping this will be the one I go all the way to that goal. You said exactly what I thought about Joy rocking a mini skirt. She wears many surprising things so well, why couldn’t she throw on some tights with that mini and look as smashing as ever? And you say you’re aging? What? I own a ton of personal vintage... Some I know 100% will never be worn again, but carry soooo many memories...others are just waiting for the right time & place. I'd say, these where just waiting for that time & place. Wear them and love them. *laughing* Well, like Joyce says, the thought of my actually wearing that 60s red suede miniskirt—the one with studs, no less!—carefully packed away at the bottom of my trunk is a bit daunting. My hips may still be slim enough to shimmy it on, but the rest of me, including my style sense, has definitely turned a corner. That said, I DO wear my vintage ‘70s camel duffle coat, carry my ‘80s Coach saddle bag, and pull out my ‘90s heavy gold cuffs from time to time. Those pieces of my past are as indicative of my style now as they were in past decades. However, that ‘60s red mini, along with a ‘70s hand knit Scandinavian sweater in moody greys and blues and an early Ann Demeulemeester jacket I bought in Antwerp in the late eighties remain in permanent storage. They are iconic-to-me items from my past which will never be worn, but neither will ever be tossed into a Goodwill bag. They hold too many memories to ever think of letting some stranger have them. For what it’s worth, the fact that your newest acquisition— that gorgeous leather coat—pairs so well with the pants makes me think the cut-off date for them could still be in the future. But, really, only you, not a forum vote, can say if your pants fit into where you are going now, instead of where you’ve been. I think if you want to wear them then you should wear them - or at least try a couple of times. I think they are fab but I do know the feeling of having moved past a piece and not going back there. I still wear these pieces from time to time (the painting tee gets worn the most LOL, it dates from a French Ski holiday - my only European ski holiday). There are a few styles I do not own and cannot go back to because of strong associations with a period of my life. The association I have with me wearing these pieces mean I will have to admire them from the sidelines, and enjoy other people rocking them, which they do. Well, I don't remember any fashion like this "first time around" so *I* don't have any vintage baggage to bring to the situation. I think you look pretty fab in them. p.s. - I was listening to a Malcolm Gladwell podcast last night, and he noted that there is some scientific study that indicates the music you listen to and love at 19-20yo, is a deep-seated love that stays with you all your life. Maybe it's the same for fashion? Definitely YAY! I think #4 is my fav, but 6/7 are wonderful too. Those pants are awesome and you look awesome in them. WOW!!! Amazing. They defy trends. I definitely have vintage pieces. 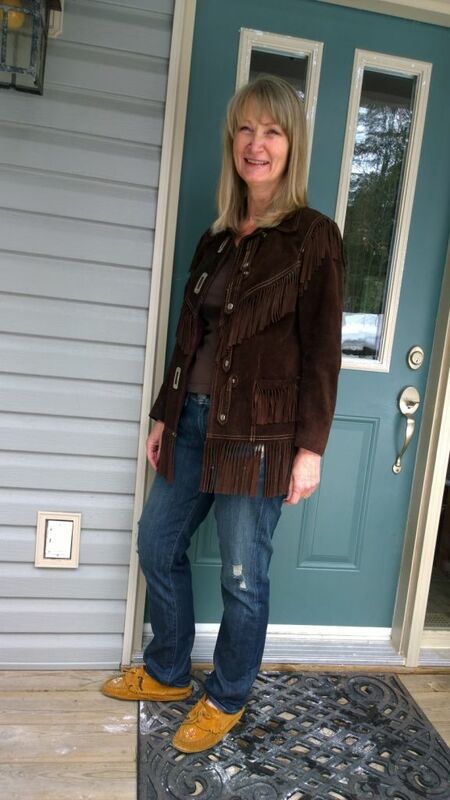 My favourite piece (and Mr Style Fan`s) is my brown suede fringe jacket that I bought in high school (probably 1969 or early 70s). I have a picture of it for a challenge YLF did. I also have a Pucci print shirt. Then there are some mini skirts. I think the pants look great on you and if you are drawn to them I hope you do wear them! I agree with others who have said that they are so fashion-forward that they are not really of a particular era and thus don't "date" in the same way that many garments do. I think that if you (that's a general you, not you specifically approprio) are going to have a large wardrobe, then you have to be comfortable with things coming in and out of favor. (Mainly because I think our brains really can't track keeping too many garments in rotation at one time.) One of the things I really admire about Angie's approach to her wardrobe is the confidence and complete lack of apparent angst with which she does this. That's something that I really aspire to. I think that "personal vintage" is really just the extreme form of this. I say go for it. Along those lines, I really love #6 with your new black leather topper. That is my favorite from a philosophical perspective. I can't choose a favorite from an aesthetic perspective -- they are all great. I'm curious if you can identify how you are styling the pants differently now than you would have when you wore them the first time around. Does that make sense? You need to wear those. Honestly, NEED to. Very Sacai! Go for it! Yay! I like the pants with new long leather jacket. I have a trench coat I bought back in the 80s. I don't wear it and should pass it along. Minimal experience with vintage, but those look more one-a-kind than dated. They’re too unique to pass up. Possibly due to my lack of fashion past, but probably due to their transcendent style, your flares do not date to any particular time to me. They are timeless fab as classic and avant garde can be. I have quite a bit of vintage but no personal vintage at all - moved too many times in my youth to accumulate much of anything but, somehow, books. Those are some fabulous, super fun, chic party pants! I agree they would dynamite for a New Year's party (just because that's around the corner) or any fun event. I especially like 1/2 and 6/7, and I think you could style them a lot of great ways, but I like a fairly simple support act with them. They look equally good with chunky sneakers or heels as you've shown here. My personal vintage item is a loden coat from Austria, bought in the early 90s. I removed the shoulder pads and narrowed the shoulders for a less "linebacker" look and started wearing it again a few years ago. Love! Please wear them! Please! So glad you showed them to us too! I've really enjoyed reading everyone's observations on those things we keep, and why we keep them. I'm mighty relieved I'm not the only one with an archive. Gaylene, I have a few personal icons here as well. Speaking of which, Style Fan, this thread was worth it just to get another look at that fringed jacket. Same goes for the Loden coat, Firecracker! Wear it forever! Those pants are amazing--totally see why you hung onto them. They look especially well with the new black coat and the striped top.